SERVICES AT LINEAGE LOGISTICS' NEW CHARLESTON FACILITY INCLUDE RAIL AND TRANSLOAD, FREIGHT CONSOLIDATION, BLAST FREEZING, IMPORT/EXPORT, AND CUSTOM LABELING AND STAMPING: The 21-acre lot has 30 truck doors and four rail doors, as well as parking for 100 autos. Lineage Logistics received incentives from South Carolina as a part of new project. 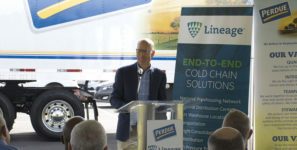 Lineage Logistics, a warehousing and logistics company held a grand opening for its state-of-the-art 180,000 square-foot cold storage distribution center in Charleston County, South Carolina. The new facility offers immediate access to the port of Charleston and I-26, with regular rail service through Norfolk Southern. Services at the Charleston facility include rail and transload, freight consolidation, blast freezing, import/export, and custom labeling and stamping. The 21-acre lot has 30 truck doors and four rail doors, as well as parking for 100 autos. Lineage Logistics is one of the largest temperature-controlled warehousing and logistics companies in the world. Lineage is backed by Bay Grove, LLC, a principal investment firm dedicated to partnering with strong management teams to invest in and build long-term platform investments. Over the last six years, Bay Grove has built Lineage Logistics through acquisitions and investments completed in partnership with entrepreneurs, managers, and employees. The firm, based in San Francisco, has deep experience in the warehousing and logistics industry.